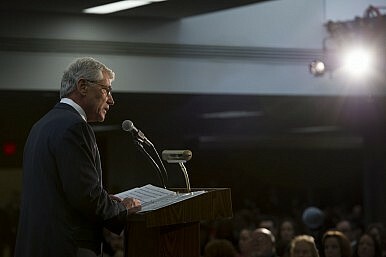 Hagel’s remarks supporting the National Security Agency will do little to ease international tensions over cyber-space. In a speech given at Fort Meade, Maryland, the headquarters of the NSA and Cyber Command, Defense Secretary Chuck Hagel attempted to lay out the U.S. vision for future cyber-intelligence activities. The speech, made at the retirement ceremony for NSA director General Keith Alexander, both praised previous NSA activities while promising to be open and transparent about cyber activities in the future. Other nations, from Germany to China, would probably wonder how exactly the NSA’s various cyber-espionage activities embody “integrity, reliability, and openness.” Indeed, even while Hagel was promising openness and transparency, he pointedly did not back away from supporting the NSA’s controversial intelligence programs, which include wire-tapping the phones of German and Brazilian leaders, hacking into Chinese telecommunication firm Huawei, and using U.S. embassies on foreign soil as hubs for extensive surveillance programs. In his speech, Hagel expressed only support for retiring NSA director Gen. Keith Alexander—and, by extension, for the controversial NSA practices. Hagel praised Alexander for his “fierce, but necessary determination to develop and protect tools vital to our national security.” And while Hagel promised to “engage in a more open dialogue with the American public” about privacy rights, he also made clear that “we will sustain our investments in intelligence.” There was no mention of rolling back any programs already in place, or even reevaluating controversial NSA intelligence gathering methods. In fact, if we look closely, Hagel didn’t promise any changes to the way the NSA and U.S. Cyber Command operate. He told the world that “DOD will maintain an approach of restraint to any cyber operations outside the U.S. Government networks”—the word “maintain” suggests that Hagel already believes the NSA has been a model of restraint in this regard. Likewise, Hagel promised to “continue to take steps to be open and transparent about our cyber capabilities,” implying that the Pentagon believes it had made progress in this area already. Of course, U.S. rivals in cyberspace (notably China) haven proven even less transparent about their activities. Chinese officials resolutely claim that China does not engage in any hacking activities or cyber-attacks, and there’s little chance of a Chinese counter-part to Edward Snowden popping up to refute these claims. However, the U.S. can hardly claim credit for the transparency caused by the Snowden leaks—without the leaks and ensuing media reports, the world would probably know little more about the United States’ cyber-activities than it does about China’s. That hardly seems indicative of the “open and transparent” stance Hagel tried to credit the Pentagon with. Given the lack of commitment to any real change, it’s unlikely Hagel’s speech will achieve what was widely seen as its goal: lowering tensions over cyberspace before Hagel makes his first trip to China as Secretary of Defense. Reuters, citing senior defense officials, said that the speech was an attempt to “ease strains and shape the dialogue over cyber issues” in advance of Hagel’s trip. “We want the Chinese, just like we want our allies and others around the world, to understand what it is we’re doing in building a cyber force at CyberCom, understand how we operate, understand the policies we use, like the policy of restraint,” a senior defense official told Reuters. China and other nations are probably wondering what exactly the NSA’s “policy of restraint” means given the wide array of cyber-espionage conducted on embassies, government officials, and businesses worldwide. Until this question is answered, promises from Hagel to continue previous policies will only be cause for concern, not for relief.